Betsy on a bridge over the Little Pigeon River. March 28, 2009. 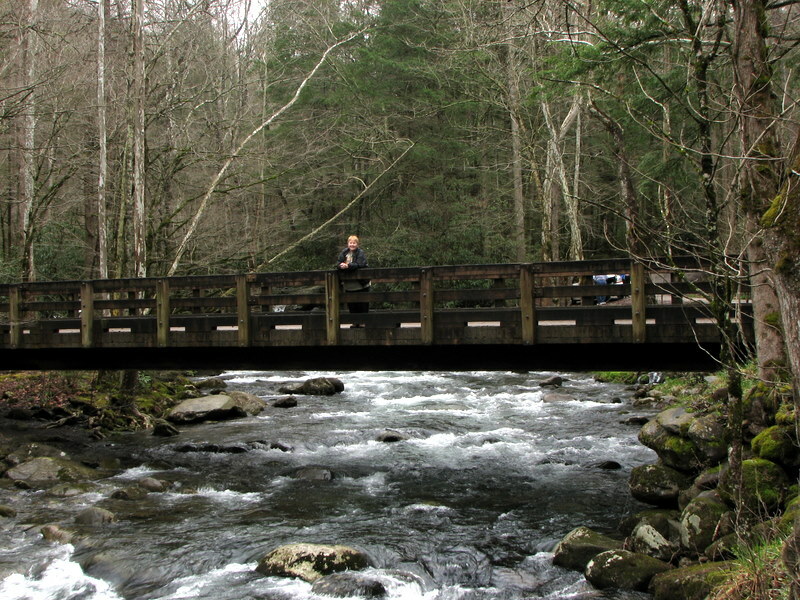 The picture above is of my favorite hiking partner on a bridge over the Little Pigeon River in the Great Smoky Mountain National Park. The picture was taken in March, while we were staying in a cabin at Serenity Falls. We had gone to the area of Greenbrier Campground to drive and hike along the river. There had been several days of rain prior to our visit, so the water was rushing over the rocks and boulders. The sight and sound of that rushing river in the forest/mountain setting is an experience that everyone should have at least once. This entry was posted on May 27, 2009 at 3:33 am and is filed under Watery Wednesday. You can follow any responses to this entry through the RSS 2.0 feed. You can leave a response, or trackback from your own site. Beautiful shot George! It looks like one of those shots on postcards. I bet its really nice up in the mountains during the winter months with all the snow. I hope the water still looks like this next week. We’re looking forward to our trip. Thanks for sharing this lovely photo! And thanks for all the tender care of your roses so that we can see the view from her bench!! George: Neat capture of Betsy on the bridge. I enjoyed all your plantings of the roses on Betsy’s site. That is a gorgeous picture…and I think I recognize your favorite hiking partner!!!! Water water everywhere, great shot George. Beautiful. It’s wonderful to see you have your best friend, hiking partner, and fellow blogger wife on all your escapades. Sure is a lovely place…. Great shot of a lovely place to be! I know you had a great time on your trip! Your wife is showing off all your roses..I love the idea of them in pots. I could do that as I don’t have the room here either…I need to go out and find some water to photograph other than the pond…I love how moving water looks….